The discriminant scores are . An observation is classified into group u if setting t = u produces the largest value of or the smallest value of . If this largest posterior probability is less than the threshold specified, is labeled as Other. The classification of an observation vector is based on the estimated group-specific densities from the training set. From these estimated densities, the posterior probabilities of group membership at are evaluated. An observation is classified into group u if setting produces the largest value of . If there is a tie for the largest probability or if this largest probability is less than the threshold specified, is labeled as Other. where is the estimated unconditional density. If is zero, the observation is labeled as Other. If the closed ellipsoid centered at does not include any training set observations, is zero and is labeled as Other. When the prior probabilities are equal, is proportional to and is classified into the group that has the highest proportion of observations in the closed ellipsoid. When the prior probabilities are proportional to the group sizes, , is classified into the group that has the largest number of observations in the closed ellipsoid. where is the volume of the ellipsoid bounded by . Since the pooled within-group covariance matrix is used to calculate the distances used in the nearest-neighbor method, the volume is a constant independent of group membership. When k = 1 is used in the nearest-neighbor rule, is classified into the group associated with the point that yields the smallest squared distance . Prior probabilities affect nearest-neighbor results in the same way that they affect uniform-kernel results. In nearest-neighbor methods, the choice of k is usually relatively uncritical (Hand 1982). A practical approach is to try several different values of the smoothing parameters within the context of the particular application and to choose the one that gives the best cross validated estimate of the error rate. Another way to reduce bias is cross validation (Lachenbruch and Mickey 1968). Cross validation treats n – 1 out of n training observations as a training set. It determines the discriminant functions based on these n – 1 observations and then applies them to classify the one observation left out. This is done for each of the n training observations. The misclassification rate for each group is the proportion of sample observations in that group that are misclassified. This method achieves a nearly unbiased estimate but with a relatively large variance. To reduce the variance in an error-count estimate, smoothed error-rate estimates are suggested (Glick 1978). Instead of summing terms that are either zero or one as in the error-count estimator, the smoothed estimator uses a continuum of values between zero and one in the terms that are summed. The resulting estimator has a smaller variance than the error-count estimate. The posterior probability error-rate estimates provided by the POSTERR option in the PROC DISCRIM statement (see the section Posterior Probability Error-Rate Estimates) are smoothed error-rate estimates. The posterior probability estimates for each group are based on the posterior probabilities of the observations classified into that same group. The posterior probability estimates provide good estimates of the error rate when the posterior probabilities are accurate. When a parametric classification criterion (linear or quadratic discriminant function) is derived from a nonnormal population, the resulting posterior probability error-rate estimators might not be appropriate. 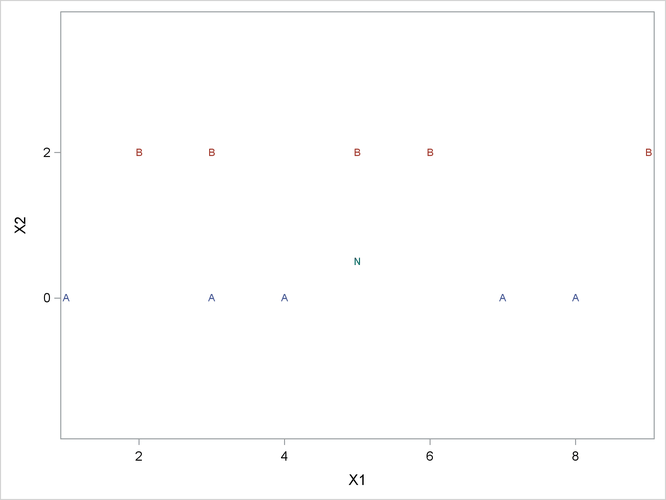 Consider the plot shown in Figure 35.6 with two variables, X1 and X2, and two classes, A and B. The within-class covariance matrix is diagonal, with a positive value for X1 but zero for X2. Using a Moore-Penrose pseudo-inverse would effectively ignore X2 in doing the classification, and the two classes would have a zero generalized distance and could not be discriminated at all. The quasi inverse used by PROC DISCRIM replaces the zero variance for X2 with a small positive number to remove the singularity. This permits X2 to be used in the discrimination and results correctly in a large generalized distance between the two classes and a zero error rate. It also permits new observations, such as the one indicated by N, to be classified in a reasonable way. PROC CANDISC also uses a quasi inverse when the total-sample covariance matrix is considered to be singular and Mahalanobis distances are requested. This problem with singular within-class covariance matrices is discussed in Ripley (1996, p. 38). The use of the quasi inverse is an innovation introduced by SAS.